Parental Alienation Problems! - Miams can help you! In many cases, parents are never aware of the damages they cause their children. When parents separate, there is a high likelihood that the children will be turned against the parent they do not live. Mediation can hep with this! [ultimate_heading main_heading=”Parental Alienation” main_heading_color=”#000000″ sub_heading_color=”#333333″ alignment=”left” main_heading_style=”font-weight:bold;” main_heading_font_size=”desktop:24px;” sub_heading_font_size=”desktop:14px;” main_heading_margin=”margin-bottom:15px;”]The family as an institution goes through various challenges, one of them being divorced. When parents separate, there is a high likelihood that the children will be turned against the parent they do not live. [ultimate_heading main_heading=”Children alienation” main_heading_color=”#000000″ sub_heading_color=”#333333″ alignment=”left” main_heading_style=”font-weight:bold;” main_heading_font_size=”desktop:18px;” sub_heading_font_size=”desktop:14px;” main_heading_margin=”margin-bottom:15px;”]Children who resist contact after a divorce are branded “alienated” whereas their parents are referred to as abusive and “alienated parents”. However, this perspective has brought in a different view. [ultimate_heading main_heading=”Impact of abusive parents” main_heading_color=”#000000″ sub_heading_color=”#333333″ alignment=”left” main_heading_style=”font-weight:bold;” main_heading_font_size=”desktop:18px;” sub_heading_font_size=”desktop:14px;” main_heading_margin=”margin-bottom:15px;”]Instances of child abuse may remain unnoticed. Moreover, the child may be taken away from the parents whose main aim was only to protect their children. A plan has been put in place to help abusive parents correct their behaviour, with the aid of intense therapy. [ultimate_heading main_heading=”Parents are never aware of the damage they cause” main_heading_color=”#000000″ sub_heading_color=”#333333″ alignment=”left” main_heading_style=”font-weight:bold;” main_heading_font_size=”desktop:18px;” sub_heading_font_size=”desktop:14px;” main_heading_margin=”margin-bottom:15px;”]In many cases, parents are never aware of the damages they cause their children. 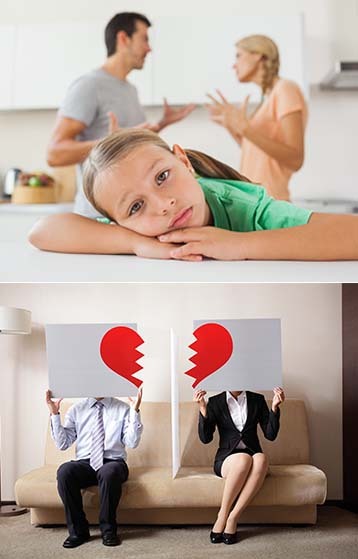 Parents think that they are separating or divorcing with good intentions. They are oblivious of the problems piling on the children and onto the adults they are growing out to be. [ultimate_heading main_heading=”Solving parental alienation” main_heading_color=”#000000″ sub_heading_color=”#333333″ alignment=”left” main_heading_style=”font-weight:bold;” main_heading_font_size=”desktop:18px;” sub_heading_font_size=”desktop:14px;” main_heading_margin=”margin-bottom:15px;”]Getting the opinions of the affected child on the issue at hand. This is by far the best shot at solving parental alienation. Forcing parents into therapy sessions to solve their relationship issues will offer very little in ensuring this issue is curbed. Hence, counselling sessions carried out under duress would be very ineffective, and therapists will not accept to offer their services. Offering more permanent support and therapy to the child will go a long way at ensuring they heal from all that they went through. It will, in turn, aid them to grow into better individuals. [ultimate_heading main_heading=”Conclusion” main_heading_color=”#000000″ sub_heading_color=”#333333″ alignment=”left” main_heading_style=”font-weight:bold;” main_heading_font_size=”desktop:18px;” sub_heading_font_size=”desktop:14px;” main_heading_margin=”margin-bottom:15px;”]Restoring the attachment of a child to their parents lies on how the issues they underwent are handled and the therapy they are accorded. Both the parents and the child would be put at risk of losing each other’s touch when there is no one to give legal advice.